The Health Department doesn't know what if any action it can take to enforce the finding that wind turbines are a public health risk. The wind farm has been operating in Shirley since 2009. Three families have moved out because they say they can't endure the low-frequency noise. Brown County health officials have declared wind turbines a public health risk, but they haven’t determined how to put their declaration into action. The county’s Health Board this month declared the Shirley Wind Farm operated by Duke Energy Renewables poses a health risk to its neighbors in the town of Glenmore. 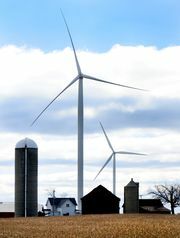 Three families have moved out of their homes rather than endure physical illness they blame on the low-frequency noise the wind turbines generate, according to Audrey Murphy, president of the board that oversees the Brown County Health Department. “We struggled with this but just felt we needed to take some action to help these citizens,” Murphy said. The Health Department has statutory authority for licensing, inspection and enforcement for businesses where health and environmental problems are at issue, but just what that means for the wind farm has not yet been determined, Friederichs said. State health officials have expressed interest in participating in Brown County’s discussion of the issue, Friederichs said. She, board members and the county’s lawyer need to put their heads together to determine the next step, she said. No timeline has been established. Whatever happens, residents “are grateful to the Board of Health for reviewing the research and listening to the people of Brown County,” said Susan Ashley, who also lives in the Shirley area and who has helped rally opposition to the wind farm through the years. Twenty families in the town have documented health issues since the wind farm started operated in 2009, Ashley said. Duke Energy Renewables was not invited to the health board’s discussion and would have cited tests that determined sound levels from the wind generators were low and could not be linked to adverse health impacts, company spokeswoman Tammie McGee said. The company has not received any formal word about the board’s declaration, McGee said. Dr. Jay Tibbetts, vice president of the Brown County health board and its medical adviser, said he knows of no science that proves there isn’t a link between health problems and the low-frequency noise the giant fans produce. People might not be able to hear the sounds the Shirley turbines produce, but Tibbetts said he knows of a teenager living in the area who can tell when the turbines are off or on without being able to see them. 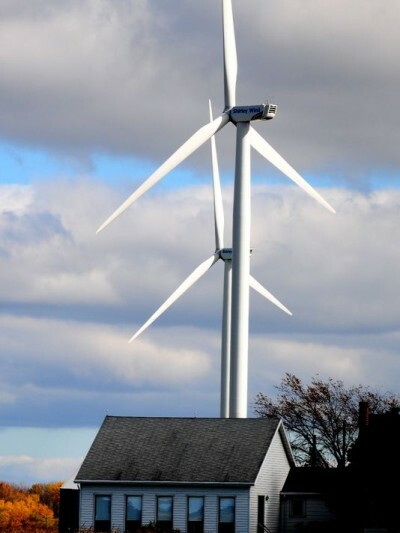 Area residents or former residents report headaches, nausea and other symptoms they say are brought on by the turbines, and those symptoms clear up when the residents move elsewhere for a time, Tibbetts said. Darrell Ashley, who is Susan Ashley’s father-in-law and lives within a mile of the Shirley turbines, said his wife moved out of the house for several months until her symptoms disappeared. She has since moved back, and her symptoms are coming back, he said. Prior to 2009, when the turbines weren’t operating, he and his wife had no such problems, he said. He praised the health board and said he appreciated that someone finally listened to residents’ complaints. Murphy said Brown County is probably the first governmental body in Wisconsin and perhaps the first in the country to make the formal declaration. The board has been wrestling with the issue for about the last four years, Murphy said. While some scientific studies have failed to find a link between health risks and the low-frequency noise that wind turbines generate, two studies done recently on the Shirley Wind Farm specifically say otherwise, Murphy said. “While there may still be debate about the precise mechanism that causes these sounds to induce the symptoms, it is clear from (these studies) … that acoustic energy emitted by operation of modern wind turbines is at the root of adverse health effects,” Murphy said.